If there is one Rock drum song everybody knows it’s Wipe Out. Somehow I found Bob Berryhill, original rhythm guitarist with The Surfaris. Nice guy. 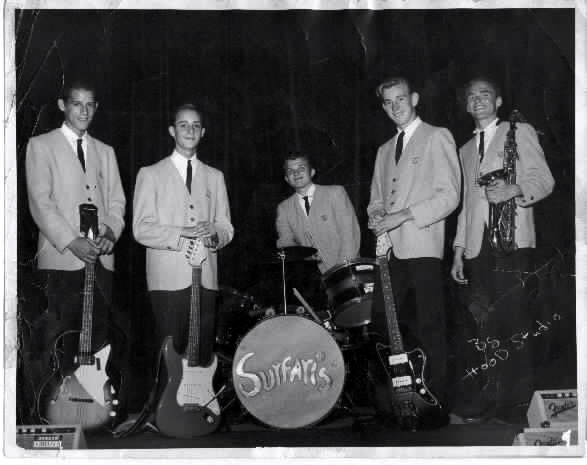 The Surfaris, with some original members, had been back together for about a year. Here is my transcription from my recorded conversation with Berryhill. I was in my Modern Drummer office. Berryhill was at his California home. The transcript is not in Question-and-Answer format. That is, I didn’t transcribe my part of our conversation. Since I was transcribing on a manual typewriter, knowing ours was purely a backgrounder interview on Wipe Out and the drummer who played Wipe Out, my best guess is I left me out to save transcribing time. It was disappointing not to be able to find drummer Ron “Ronnie” Wilson. But neither Mr. Berryhill nor anyone else I spoke to knew how to reach Mr. Wilson. On the plus side, Mr. Berryhill was kind enough to tell me how Wipe Out came to be. Bob Berryhill: Ronnie [Wilson] went to Charter Oak High School and was a drummer in the marching band. Ronnie got his start, I guess, making drum cadences for the marching band. So, Wipe Out is essentially a drum cadence for a marching band that he never gave to a band to use. But he made it up there on the spot as a cadence. That’s what he was good at doing. Wipe Out just happened to be a pattern that he came across. I don’t know if he’d worked on it before or not. But, I know that he just came up with the cadence right there in the studio. So, it was written right in the studio. He was a senior in high school. I don’t know if he was the leader of the drum section or not. But, I know that the drumming director would ask him to come up with new cadences for the band to march to. That was his flair and he loved to do that. It just naturally slipped into what Wipe Out came to be. We went in to record Surfer Joe — the song that Ronnie had a dream about a few weeks before. After we recorded Surfer Joe, and we needed a B side for the record, we said, “Let’s come up with an instrumental.” We just started kicking it around and came up with Wipe Out in about 10- or 15-minutes. Ronnie liked to surf. And one evening he just had a dream. It was a dream that came to him at night, and he wrote everything down. And the next day he bought it in to us at one of our practice sessions. We sat down with him and worked out the words a little better, got a few organizations down, and he already had, bascially, a melody. We just put it into some kind of an ABA thing and came up with it. We just started playing around and came up with this song. And I said, “Why don’t we kind of make it like Bongo Rock with a little bit of the breaking there.” So Ronnie could do a solo. Because that was the key to surf bands in those days. [It] was to have lots of drum solos. And Ronnie was a perfect showman. Or, a ham, let’s say. We said, “Well, let’s just make a drum solo out of it and we’ll just throw a few break chords in there.” And Jim Fuller played the melody. Dale Smallen, who was our original manager, was producing the record. [He] used to do witches’ laughs and things like that for his own documentary films. He came up with the laugh after we decided on having Wipe Out as the title. We broke some old cement plasterboard over a microphone and [Dale] let out with his witch’s laugh. And it became Wipe Out. We were only 15-years old. Ronnie was the oldest and he hadn’t even graduated from high school yet. We recorded that somewhere around December of ’62. It was a number one hit in June of ’63. It went rather fast. We were overnight, I suppose. We’d only been playing since, like, October of ’62 together as a group. It was just like a natural thing because we’d already won several Battle of the Bands contests that we used to have at the teen centers. We already played with The Beach Boys because they used to come to our teen center and play there. So it was kind of a progression. I don’t know if Ronnie had ever played in a band before. He’d only done the marching band for the high school. He wanted to be in a band, but never was, to my knowledge. Jim Fuller and Pat Connoly called me on the phone about 10 o’clock on a Saturday and said, “Hey, would you like to get together and practice today?” They came over to my house. We all plugged into my one Bandmaster amplifier and we played for about four hours. Then they said, “Hey, I’ve got a dance tonight. We’re going to meet a drummer at Pomona Catholic High School.” We got together and played our first dance and had never even been with Ronnie. We played a whole four-hour dance with four guys that had never seen each other hardly before. We played things like Ramrod, Bulldog — the stuff that The Champs had written, The Ventures had written, The Tornados had written. It was a lot of simple blues. Just hard-driving kind of guitar sound. So it wasn’t too hard. It was just basically three-chord blues in a rock fashion, I suppose. We went to Japan, Australia, New Zealand, and stayed mostly on the West Coast here, and went on various outings in Southern California. I think our first away gig we went to Fresno and played with The Righteous Brothers. That was when Little Latin Lupe Lu was their first song. We were the backup band for them. We played the Cinnamon Cinder’s when they were just getting started. I had pneumonia that night. I spent most of my time in the shower with a steam bath inbetween concerts. We did four nights in a row there. We played together from about ’62 to ’66 and then we basically broke up. The original group. Jim Pash [Surfaris saxophonist] kept the group on and got some other people together and played and recorded. We’ve gotten together again last year. This is our one-year anniversary. We got together a year ago. Right now we have Jim Pash (sax), Jim Fuller is playing bass. I’m playing rhythm guitar and lead. Then we have Kelly Lammers — who was a devotee of ours back in the early days — started playing about 1966 with us. We’re using Don Murray on drums. He was the original drummer with The Turtles. He was in a group before that called The Crossfires, which was a surf band, which turned into be The Turtles. We’re doing a pretty good sound right now. I believe Ronnie’s playing around the ‘Frisco area. I heard that he had a group for a while there that he was trying to get going. I think it’s a rock group of some nature. I’ve never heard it. But according to our lawyer, who [Ronnie] had sent tapes to, said it isn’t too good. But that could be just because of the guys he’s with. I think it’s called Red Dog or something like that. I know he just kind of hangs around there in central California and does things. He’s really into Rennaisance Fairs and stuff like that. He’s always been kind of crazy about kilts. I think Rodney Bingenheimer, who’s a disc jockey down her on KROQ, calls Wipe Out the Garage Anthem. It’s just one of those kind of songs where a bunch of guys got together and said, “Hey, let’s come up with a song.” And just sort of hit it, you know? Comes out to be a classic that is remembered forever. We used to play Sacramento — which was a big area then. It was a Corvette Club who brought us up there. In those days, they didn’t have 8-tracks, but they had record players in their Corvettes. And they’d cruise this drive-in and just play Wipe Out as loud as they could. 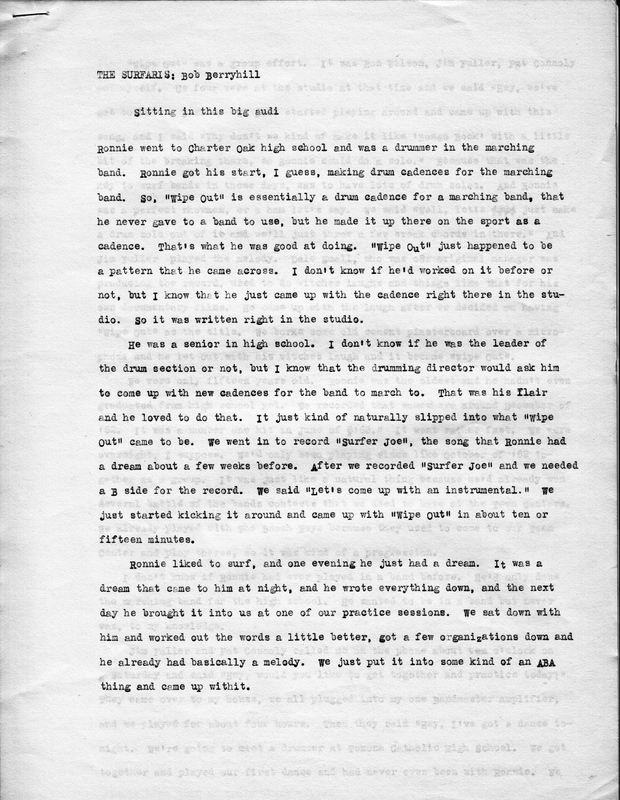 This entry was posted in Backgrounder Interviews, SKF Blog and tagged Bob Berryhill, Don Murray, Modern Drummer, Ron Wilson, Scott K Fish, Surf Music, The Surfaris, Wipe Out. Bookmark the permalink.